This photo was originally a horizontal with part of the groom visible on the right, however it did nothing for the composition. Cropping it square puts the emphasis on the flowers being held by the bride—and makes it an ideal shot to share on social media. D5, AF-S 24-120mm f/4G ED VR, focal length at 120mm, 1/400 sec, f/4.5, ISO 400, Manual exposure, Matrix metering. No need for a macro lens here. The 24-120 lets you get close for tight shots like the rings in this shot, taken during the ceremony. D5, AF-S 24-120mm f/4G ED VR, focal length at 112mm, f/1000, f/4, ISO 400, Manual exposure, Matrix metering. The ideal companion lens for an FX shooter, the 24-120mm focal length of the AF-S NIKKOR 24-120mm f/4G ED VR lens gives you a range from wide to mid-telephoto lens, perfect for group photos, close up portraits and everything in between. No need to carry a bag full of lenses when you have everything you’ll need in one convenient lens. In fact, the 24-120mm is often the lens paired with Nikon FX, full frame DSLR cameras as a kit lens because of its zoom range coverage. The versatility of the 24-120mm lens really shows in this triptych of portraits of a beautiful young lady at her sweet 16 celebration. Full length, mid- and close up are all easily captured with the one lens. EXIF data (l. to r.) D4, AF-S 24-120mm f/4G ED VR, focal length at 46mm, 1/250 sec, f/6.3, ISO 100, Aperture priority, Matrix metering, fill-flash. ; D4, AF-S 24-120mm f/4G ED VR, focal length at 78mm, 1/250 sec, f/6.3, ISO 110, Aperture priority, Matrix metering, fill-flash. ; D4, AF-S 24-120mm f/4G ED VR, focal length at 112mm, f/250 sec, f/6.3, ISO 140, Aperture priority, Matrix metering, fill-flash. Get a tight shot of the cake, showing off the decorations. D4, AF-S 24-120mm f/4G ED VR, focal length at 30mm, 1/250 sec, f/8, ISO 1600, Program, Matrix metering, flash. And get a wide shot with the family—all without having to move an inch. D4, AF-S 24-120mm f/4G ED VR, focal length at 55mm, 1/250 sec, f/8, ISO 1600, Program, Matrix metering, flash. Traveling light and being able to shoot quickly with a lens always on your camera are benefits that can’t be beat. The constant f/4 aperture means no matter where you are in the zoom range, the lens will let in lots of light; whether you’re at the wide end of the zoom range at 24mm or zoomed in all the way, at 120mm, the lens opens up to f/4. While the framing of the window itself would make for a great image, including the pink wall added more of a graphic element to the image. D850, AF-S 24-120mm f/4G ED VR, focal length at 100mm, 1/250 sec, f/7.1, ISO 100, Program, Matrix metering, fill-flash. The 24-120 lets you include only what you want, and leave out extraneous objects. The emphasis here is mom and her beautiful baby. D850, AF-S 24-120mm f/4G ED VR, focal length at 65mm, 1/250 sec, f/9, ISO 100, Program, Matrix metering, fill-flash. Vertical or horizontal, as seen here, the 24-120mm lens lets you include enough of a subject’s surroundings for a casual candid moment. D850, AF-S 24-120mm f/4G ED VR, focal length at 65mm, 1/250 sec, f/7.1, ISO 3200, Aperture priority, Matrix metering, bounce-flash. The 24mm focal length is also ideal for landscapes, architecture, street photography, weddings and more, giving you the wide field of view necessary for these images. It lets you get the wide shot, then zoom in for a closer view. When photographing portraits, having a zoom lens on your camera lets you quickly and smoothly change up the composition while being able to stay in a relatively close distance to your subject. For event photography it allows you to capture all the various images you’ll encounter, from small to large groups, demonstrations by a speaker or a crowd of partygoers on the dance floor. Capture a wide, sprawling landscape… D850, AF-S 24-120mm f/4G ED VR, focal length at 24mm, 1/125 sec, f/11, ISO 200, Manual exposure, Matrix metering. Or zoom in for a tight shot on part of the scene. D850, AF-S NIKKOR 24-120mm f/4G ED VR, focal length at 105mm, 1/60 sec, f/11, ISO 200, Manual exposure, Matrix metering. For even extra versatility, shooting the 24-120mm on an FX camera and you want a little extra reach—put the camera into DX Crop mode and you get a similar field of view of a 36-180mm lens—as if you had used the lens on a DX body. Shooting stills or video, the 24-120mm zoom range has got you covered. Great focal length range makes this a favorite for shooting video on a DSLR as well as stills. The lens is fast enough for low light shooting with a coverage range that would suffice as being able to handle wide, standard and short telephoto. Sunrise in Wyoming. At 24mm, this lens lets you capture a broad landscape with ease. D810, AF-S 24-120mm f/4G ED VR, focal length at 24mm, 1.3 sec, f/16, ISO 100, Aperture priority, Matrix metering. The 24-120 features a minimum focus distance of 1.5 feet for tight crops in camera. D5, AF-S NIKKOR 24-120mm f/4G ED VR, focal length at 120mm, 1/500 sec, f/11, ISO 400, Manual exposure, Matrix metering, exposure compensation +1/3. The constant f/4 maximum aperture maintains exposure settings throughout the entire zoom range, a bonus when shooting video. And with its closest focusing at 1.5 feet, you can get pretty close to your subject. With the addition of the Nikon Z series mirrorless full frame cameras, you can also add the 24-120 to the optional Mount Adapter FTZ—now that’s versatility! If you’re looking for a workhorse of a lens with an all-purpose focal length, that can capture stunning image quality through the entire zoom range, the AF-S NIKKOR 24-120mm f/4G ED VR is a lens you’ll never want to be without. 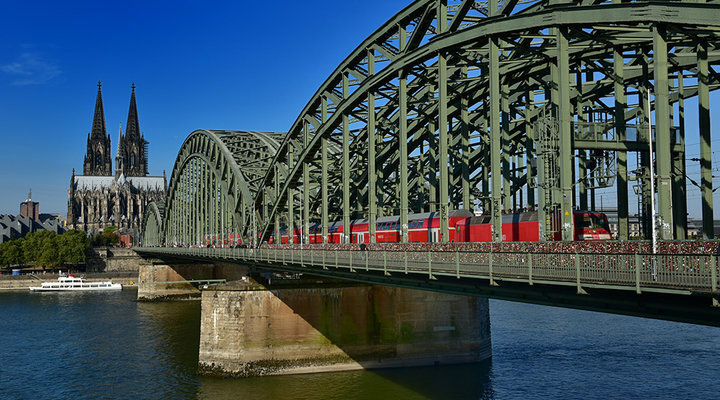 The 24-120mm lens shines when photographing cityscapes, such as this one in Cologne, Germany. Here the photographer used the leading lines of the bridge to direct the viewer’s eye to the cathedral. D750, AF-S 24-120mm f/4G ED VR, focal length at 38mm, 1/200 sec, f/11, ISO 100, Manual exposure, Matrix metering. At the wide end, the 24-120mm lens captures a grouping of buildings in downtown NYC, as seen here. D850, AF-S NIKKOR 24-120mm f/4G ED VR, focal length at 35mm, 1/1600 sec, f/8, ISO 320, Manual exposure, Matrix metering. Palm Trees at sunset in Hawaii, what could be better… D4, AF-S 24-120mm f/4G ED VR, focal length at 52mm, 1/1600 sec, f/4, ISO 640, Aperture priority, Matrix metering. HomeEducationEducational ArticlesIdeas & InspirationLooking for a workhorse of a lens? The 24-120 f/4 NIKKOR is for you.